A casino party brings all the fun, excitement and glamour of Vegas to just about any type of event – from a small family party, granny’s 60th or a school prom. A casino night brings fun and laughter and gives everyone the chance to experience the thrill of gambling the night away without losing a single penny. And best of all it helps your guests mingle and get to know each other. We recommend two tables for up to 50 guests; remember not everyone plays at the same time! Roulette and Blackjack are the best tables to start with as these two games are the most popular and easy to learn. Good for the beginner. We have all the most popular casino games such as Roulette, Blackjack, Texas Hold’em Poker, Wheel of Fortune, Casino Stud Poker, Dice (Craps) and Chuck a Luck. All our gaming tables are authentic and feature genuine casino baize, leather arm pads and mahogany legs and all are kept in pristine condition. Our Roulette wheels are solid, highly polished mahogany, with a mirror bright chrome centerpiece and perfectly balanced. Our croupiers are not only employed for their professionalism and fun personalities but also for their ability to show you and your guests how to get the most fun out of any game played. As the evening draws to a close, we can offer a variety of party games to bring the night to end – such as game playoffs, couple pairs blow out… and much more. Our croupiers can organize and manage the casino party games, ensuring a night never forgotten. And remember Ace of Diamonds has an extensive range of Themed props, Photo Booths and Table centers which we can offer to alongside our casino hire at reduced rates. Call now and talk to one of our event organisers who will help you put your perfect event together. We are passionate about creating entertainment that will be remembered. How does a casino party work? No license is required for Fun Casino entertainment, and non-cash prizes can be presented to the winner(s). Good afternoon, Samantha, I hope you are well. A really big thank you to you and the team for providing the entertainment for my 40th Birthday on Saturday 3 November 2018. The Showgirls were so glamorous and they looked amazing. They were perfect and extremely professional at greeting the guests, handing out the fun money and cupcakes and having photos taken. 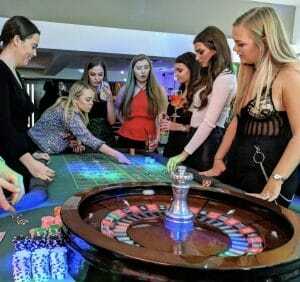 The Blackjack and Roulette tables were very popular with guests throughout the whole evening. The photo booth was a great success too and we all had a lot of fun and some great photos to remember a great evening. A special thanks to you, the Croupiers, the Photo Booth Technician and the Showgirls for a fantastic evening. You kept me very well informed throughout my whole reservation and co-ordinated the final details to make everything perfect on the night. Want can I say, another storming evening of entertainment provided by the Ace of Diamonds team. I cannot thank you enough for all your guidance, support and managing me to an exceptional level. Your expertise and professionalism is second to none. I wanted to write a whole essay on how great your business/service is but it doesn’t need it. Apart from to say… Superb, Amazing, Outstanding, Professional, Friendly, Courteous and above all, there is no other Casino company that I would use or recommend. Hi there, You came to Thurrock Yacht Club last week to run a casino event for me and I want to thank you for a great evening. The croupiers were professional but entertaining and helpful to the punters, most of us didn’t have a clue! A big thank you for a fabulous night at The ARC Company Awards Ceremony. Everyone had a great time on the roulette and blackjack tables and the photo booth was great fun. You and your team set up with minimal fuss and did everything you said you would do. Hope to see you again next year for the next Awards Ceremony. I just wanted to thank you for Saturday night. The roulette table went down very well with our guests and Glenn was excellent. I will definitely recommend to friends and consider for future events. Many thanks. Hello! I just wanted to say a ‘big thank you’ to you and your team for the terrific entertainment last night. Everyone thoroughly enjoyed themselves. I hope you all got home safely – I bet you were exhausted! We just wanted to thank you for your incredible casino at our wedding a couple of weeks ago at Hengrave Hall. Your croupiers were fantastic, so friendly and fun and they went down amazingly with our guests! Many thanks again, I will definitely be recommending you and hopefully booking you for some birthdays in the future! I would just like to say thank you for last night, your team was very friendly, polite and professional. Everyone really enjoyed the games and the photo booth. It was a brilliant evening and hopefully, we can work together in another function in the future. We did have a Brilliant evening Thank you, The Croupiers Jessica & Andy were very professional and for some players (Myself included) who have never played Blackjack or Roulette they talked you through when playing which I thought was brilliant! Thank you so much for contributing to Friday. What a success – I never imagined it would be so good. Watching all the faces was very exciting as you could see they were all enjoying themselves. We made £1186 profit which we are stunned by but of course this was largely due to you, so thanks. Please say a big thank you to your croupiers they are really appreciated. I can only say what another great evening. This was our 4th year of hiring your Ace of Diamonds and every year our numbers increase. I can only say that this reflects your professional service & the spirit of your croupiers they are always polite and enthusiastic. Please pass on my thanks to Charlie & Rebecca & wish them both good luck with their travels around the world, hopefully, they will be back in time for our next event. P.S Congrats on your business awards. If you ever need any recommendations I would be only too pleased to pass one on. You will be pleased to know the party carried on until a very drunken wee small hours of the morning and we are only just recovering now! I would just like to say a big thank you on behalf of everyone here at Maritz CX, The casino hire went down brilliantly with everyone here last night. Your staff were very professional and willing to help anyone who wasn’t too sure with the rules. Whilst I personally didn’t have much luck on the night, it was a great addition to the event. I would like to say a big thank you to your team on Friday 4th December. What a wonderful job they done, everyone at our party commented on how friendly they were. Just wanted to say a huge thank you to you and your team for providing us with a fabulous Las Vegas night for my husbands 50th, set up was amazing and the staff completely fantastic. Please pass on my encouraging note to your boss We ended up leaving here at 2am The huge clean up operation is on now lol Once again thank you for your hard work and putting up with our drunk students. Just wanted to say a massive thank you to yourself and your team for a brilliant service on Friday night. Me and Lee absolutely loved the photo booth and Casino tables, as did all our guests. It was a major talking point of the night and was one of the highlights of our wedding! To view the online gallery of all our photo booth pictures can you please let us know how we do this, as our guests would like to see them too. I just wanted to say a big THANK YOU from all of us for a fantastic evening. The fun casino was a big success from the youngest to the older guests. I am so glad we booked your company and I wouldn’t hesitate in recommending Ace of Diamonds to friends and family. Please do not hesitate in adding this to your testimonial page on your web site. Thank you so much for choosing Remus Horse Sanctuary as one of your charities to support in 2015 – we made almost £3,000! It was a fantastic night, your team was so helpful as you were in the build-up to the event. I didn’t have to worry abt a thing on the night as you had so professionally guided me through the evening as when to call raffles etc etc. On behalf of Remus, I cannot thank you enough for not only allowing us to raise much-needed funds for the Sanctuary but for also making such an enjoyable evening for all our guests. Thank you very much for your help with organising the casino and photobooth element for Gatfest. It is much appreciated how quickly you responded to questions alongside how accommodating you were to our ideas. We received great feedback about both elements of your service from those who attended both evenings and would like to say a huge thanks to both you and your staff for delivering an excellent service. I just wanted to say Thank you for providing us your services for our Ball. Everything went very well, so thank you for doing everything so smoothly. We look forward to having you again at the next Ball, once we have confirmed the date of next Ball. I thought I would drop a line to you, to say what a great time all the quests had on the casino tables. The ladies were absolutely great and the guests were complimentary. I just wanted to give you some feedback, the girls were fabulous for our event at Bishopswood House-truly professional and good fun. I would recommend them to anyone. I am just emailing to say the hugest ‘thank you’ to you & every single one of the people who were with us at our reception on Saturday. Everyone commented on how professional, welcoming & relaxed the croupiers & casino booth attendants were- we could not be more grateful to you all. People who had been made to feel uncomfortable by croupiers at other events they’ve been to comment on how much time they were given to learn how to play on Saturday. The whole event from start to finish was professional, punctual, non-intrusive (as it was so well-organized) and as the bride & groom, we could not have asked for more. I’m afraid we were in such a whirlwind that we did not get the chance to properly thank everyone, so please do pass on our gratitude. Additionally, thank you for all of your help and patience from start to finish- we will definitely recommend you to everyone we know. P.S ‘The Wheel of Fortune’ was a great hit- thank you for the recommendation! Hi Just wanted to say a big thank you for last night, the photo booth when down a storm and so did the casino. I just wanted to drop you a quick line to say a massive “Thank You” for the fantastic service you provided for my party last week. Your team turned up exactly on time and set up with the minimum of fuss. They were very professional and all of the guests commented on how friendly and helpful they were. I was very impressed, too with the collection of props that they brought along – it looked great and really gave the party the edge I was looking for. I just thought I would drop you a line to say thank you very much for the entertainment you provided. The staff loved the gaming tables and the photo booth went down an absolute storm (think I could be on for having the most photo’s in there!). If you could pass our thanks on to your staff who attended that would be great. I think Karl mentioned we would be able to have access to a link which would have all of the photo’s which were took on that evening – would it be possible to have this sent over please – not sure if we could have a photo memory book or not too. Look forward to hearing from you. Hi Sam, Thank you so much for delivering such a professional casino experience at Alex and Ben’s joint birthday party. All of our guests were encouraged to participate and the novices guided with their first steps. All ages enjoyed the evening, from 15 years to 81. We will definitely recommend Ace Casino to our friends. I just wanted to thank you so much for your support on Saturday. The event went off extremely well with no hiccups and we have had great feedback. I hope your team enjoyed themselves, they did you proud and were a great bunch!! Good feedback from everyone for Saturday. Everyone said how good the night was and how good your team were. Thank the lady who made the announcements for me please as well as the others. If I organise another I will certainly be in touch. Dear Samantha Thanks again for another fun and professional evening. You and the staff are so helpful in every way I would highly recommend the company for any event. I just wanted to send an email to say a huge thank you for last night. It was a really good evening and everyone enjoyed themselves. They all loved the casino tables and all had a really good time. Thank you to you and the others, it was great and we really appreciated all you did. It was still being talked about this morning! Just a quick e-mail to say Thank you for Saturday, Sarah the croupier was lovely and the whole set up was hassle free. I will definitely recommend you to friends. Just a quick note to thank you and your team for Saturday night. 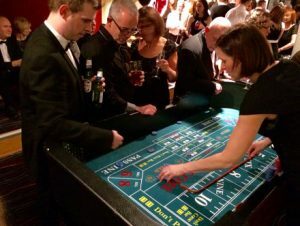 The event went without hitch and the casino proved extremely popular – my thanks to the croupiers, who were friendly, courteous and offered guidance throughout the evening. I would just like to thank you for such an amazing evening and the service your company provided for our event. The decorations were well received and the casino tables were used thoroughly throughout the night. It has been a pleasure doing business with you. I hope you had a good Christmas and a Happy New Year to you and all your staff. Thanks for everything you did for our casino party. Everyone really had good fun and rumor has it would love to do it again so perhaps we might see you in December 2014! Want can I say, another storming evening of entertainment provided by the Ace of Diamonds team. I cannot thank you enough for all your guidance, support and managing me to an exceptional level. Your expertise and professionalism are second to none. Unfortunately I don’t have any picture but the casino was wonderful. It was so professional and really made the evening special. Everyone had such a good time and was so happy to learn how to play the game. Everyone loved the party and it went so very well! We had a wonderful evening, the lady who ran the table was lovely and we would certainly recommend this to others! Here are a couple of photos of the table in play, you are welcome to use them on your site if you’d like to. We were very impressed with the casino tables we hired. They were a great addition to the evening and everyone enjoyed using them including the children even though they kept loosing. All I can say is you were exceptional. It was a fantastic night. You and the team were brilliant, helpful, kind and a pleasure to have with us. You are very skilled at what you do. Appeared calm, effortless and personal and the whole night ran in a friendly and organised way. I can’t thank you all enough. There is a letter on its way to you but thank you so much for a great evening. Your team were brilliant and everyone I have spoken to really enjoyed themselves. Just an email to say thank you so much for attending our wedding in Buxton this weekend. I know you had a hell of a journey getting there but the casino was a huge hit with our guests and the bond props looked fantastic! Just want to say that your team did an amazing job for us for both the casino and photo booth – thanks for everything. The students and Staff truly loved the casino evening ! We will be looking at booking you again it made the evening go with a bang. All of our guests enjoyed the activities. All was very well explained. I gave your number to 4 people! You guys are the best so big thank you !! Go on Facebook my golden poppy page and Zulika Joseph -Wightman and just tell what photos you would like !! Another fantastic event which proved to be highly successful. Ace of Diamonds was on time, professional and delivered what was offered. Very good communication both before and during the event with all staff providing excellent customer service and interaction while looking the part. All the guests enjoyed the evening with positive feedback received from many. Ace of Diamonds Fun Casino Hire has been providing Casino Hire, Casino Nights and Casino Party Events for 19 years. Ace of Diamonds Fun Casino brings you top class fun casino entertainment with all the fun and excitement of a real casino. Let us deal you a winning hand! You do not need a gaming licence to have a fun casino. Ace of Diamonds Fun Casino is fully insured and run to comply with the 1976 Amusement and Lotteries Act.